The news that Sergio Canavero, an Italian surgeon, and his colleague, Xiaoping Ren of China, plan to perform a ‘head transplant’ with an intention of ‘execution’, surfaced in 2017. Albeit, the pair now state that the procedure is imminent. The procedure (above) involves taking the head of an individual, unable to use their own body (i.e a quadriplegic) and transplanting it onto the body of a brain dead donor, enabling the recipient usage of a fully functional body. However with such an extreme proposal, a number of questions need to be answered to ensure ethical consideration. We can transplant a heart, why not a head? Although advancements in the medical industry are subject to tight safety regulations, it is leaps of faith from innovators like Canavero that have made the medical industry as powerful as it is today. The first successful organ transplant of a kidney back in 1954 faced similar backlash as we see today. Despite the protests, and claims of ‘playing god’, Dr Joseph Murray successfully prolonged the patient’s life a further eight years. Despite the previous failures and lack of medical approval, had this risk not been taken, Richard Herrick (the world’s first organ recipient) would have died in the months following. This breakthrough paved the way for organ transplants as a collective, saving the lives of over 100,000 people annually. With great risk comes great reward, so could there be method to the doctors madness? Unfortunately, we live in a world where unjust diseases exist that restrict an individuals life. If we focus on the outcome of an improved quality of life for those in need (utilitarianism), there’s no reason that the push for a head transplant shouldn’t be enabled. The act of goodwill alone (Kant): to push the boundaries of modern medicine, to strive for cutting edge procedures and give those wishing for a chance of a normal life – could be argued reason enough, as motivation for Canavero to continue. Who are we to prevent the wishes of consenting adults for chance of a better life? Valery Spiridonov, who suffers from Werdnig-Hoffman disease (a form of spinal muscular atrophy often leading to low life expectancy), volunteered to take part in the first ever procedure, despite its risks. This willingness to hazard survival for a chance of a better life is concerning, but ultimately relies on the attentiveness, responsibility, competence and responsiveness of the patient. Ethical practice could be reinforced, perhaps with an overseeing judgement from a medical professional. After all is said and done, it may be the case that the issue boils down to a single question. The answer however, may be more difficult than what we would expect. Despite these arguments, a vast amount of crucial scientific and ethical considerations exist, unaddressed by Canavero, which question the plausibility and foundation of the procedure. The procedure’s chance of success is questionable as most documented “successes” are only claimed by Canavero, with little evidence. Michael Beattie, an established professor of neurology at UCSF, denies the claims stating that “The genes in a mature mammalian central nervous system (CNS) that control regeneration are repressed”. Meaning “no matter how much you treat the spinal cord with polyethylene glycol and electrical currents”, the CNS will not regenerate in humans. It falls to the ethics of care to answer whether or not it is equitable for physicians to control lives with such ambiguity? The brain is considered to be an integral aspect of an individual’s identity. Therefore, if the entire body is donated, who technically ‘dies’ in the exchange? Is the recipient considered deceased and given the legal rights of the brain donor or vice versa? It’s a breach of the donors human rights in a grey area unconsidered by Canavero. When there are currently around 6000 people on the UK transplant waiting list, it begs the question of why one recipient should receive the entire body of the donor. This procedure would just further increase this number and prolong the waiting list, taking potential donations away. One body has the potential to donate organs capable of treating eight recipients, alongside tissues and blood. But with the proposed procedure, other organs cannot be donated. In regards to the principle of beneficence, with organ donations often vital for the recipient to survive (i.e heart transplants), is it fair to improve the quality of life for a single person over eight? A peer review would examine whether the potential benefits justified the risks, with established evidence to back the decision. Canavero is intentionally avoiding this, by looking for funders not requiring IRB or peer reviews. He plans to conduct the surgery in a location where the regulations governing medical practice or research are minimally enforced. The complete disregard in his obligation as a medical health practitioner raises alarm bells for the ignorance of possible ramifications (consequentialism). Additionally, Canavero would likely face criminal prosecution as intentional decapitation treads dangerously between medical care and murder – especially due to the unreliability of the surgery. The procedure would involve several dozen surgeons and take over 24 hours, so one simple mistake could prove disastrous, personally and ethically. The negligence in this “experimental” surgery opposes the intrinsic moral values that make up the deontological theory. Good article, with good ethical reasoning for. There was less ethical reasoning (although the reasoning given was good) for the against argument. Although, I think the argument where multiple patients are denied transplants since the whole body goes to one patient is utilitarianism. I liked the inclusion of ‘informed consent’ this was a good angle to take. I think this kind of idea in terms of the ‘step back in time’ section, If it was something that has a great percentage chance of working and bettering someones life, I would think it is a insane leap in the capabilities of modern medicine. However, even if that was the case. I would be terrified if someone i knew or loved would have to go through it. Based upon the article I’m against the transplant. The idea within the article is good as it does have the potential to offer a large amount of value for individuals that suffer from extreme conditions. However, the evidence of the procedure working sounds like it’s low and therefore more research would be required before human testing. Also as mentioned, a body can provide a large amount of organs to save many lives, so wouldn’t these people that require a full body transplant be on the bottom of the donor list. I enjoyed the read and the engaging discussion about the procedure. I believe it would be a huge improvement to our quality of life and agree with the “for” argument in that without risks in our past, we would have never made it to be where we are currently. Albeit, the potential risks are tremendous and the fact that it is not validated at all is very sketchy. It is a tough compromise, however when bargaining with human lives then there is only one choice. Perhaps future technology might benefit the situation? This is definitely one of those highly controversial articles where the view point of a reader would be split 50/50 for obvious ethical reasons, as mentioned in the article, have gone unaddressed by the surgeon himself. Most of which surround the potential safety and well being for the patients. The article mentions that Canavero’s procedure would involve essentially cutting the head off of a brain dead body and reattaching it to the spinal cord of another headless body. Now the biggest conserning issue here is the new chemical environment the patient will be introduced to. Providing the surgery goes without major complication and the patient survives (which would be a medical milestone in terms of spinal cord injuries itself) the newly attached head would now have to face biochemical differences between the itself and the donor body. A scenario such as this makes you wonder how much further pain and further complications could occur as the immune system would undoubtedly attack the transplant without a ridiculous amount of anti-immunosuppressants and even then, there would still be a high chance of the head and donor body not being biochemically compatible at all, potentially leaving the patient effectively unconscious, permanently. If Canavero suggests he can reattach a severed spine successfully with the spinal cord, tendons, blood vessels without on coming nerve damage. Then why doesn’t he work with patients with spinal cord injuries to help them to have a better quality of life? I’m sure everyone reading this comment is aware of the vast amount of people in the world who are unable to walk, confined to a wheel chair and are in the need of support when it comes to everyday living situations such as cooking, cleaning and evacuating their bowels. My point is, from what I have read on the article and from what I know as Canavero as a surgeon, there are far more areas in terms of medical research that he could involve himself in with his supposed skill of spinal recovery and bodily re-attachment, that are far less invasive. With the skill set he hypothetises to have, it makes you think that if he really wanted to do this for the benefit of humanity and medical science as a whole, he would have started off with something less invasive like treating spinal cord injuries, thereby accruing the relevant experience in addition to the backing and support of governing bodies as well as putting more time and effort into researching ethical considerations but he has jumped straight into wanting to perform such a controversial procedure with the world watching and with little support in the medical industry, thereby making you wonder if he is doing this, for the most part, as a PR stunt. This is an extremely fascinating topic. I have been convinced by your one vs. many argument. However, I am still interested to see if someone with a head transplant could live a full life. As pointed out by @Sik in the comments, the patient would have overcome the biochemical differences between the head and the body which may never happen, and with no support from other medical professionals, it would be best to wait until the picture becomes clearer and the ethical dilemmas are answered. I think that further research should first be done into head transplants as there are studies that suggest a human’s cognition doesn’t solely come from the brain, it comes from other parts of the body as well. This could lead to the brain finding it very difficult to adjust to the new body and so maybe the life expectancy is massively reduced, whereas donating the separate organs from the body could save multiple other people? However, in this case, we are effectively saying that quadriplegic people don’t deserve treatment as they are ‘too far gone’. Overall, further research into possible success rates and life expectancy is needed, or an initial attempt needs to be made – people with quadriplegia also deserve a chance. Quite an interesting topic, I’m not completely sure if I agree or disagree with proceeding with the implementation of head transplants. 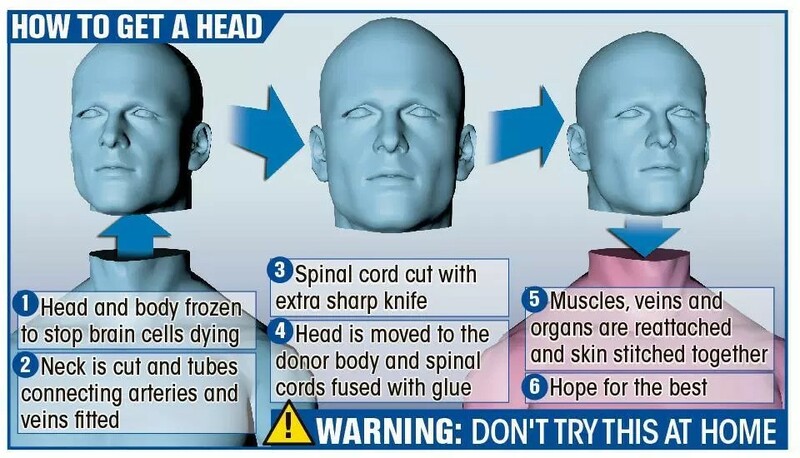 On the one hand, I’m not entirely convinced that this is a safe way to proceed with performing head transplants, there seems to be too much that is unknown about the procedure. It’s possible that the patient and their relatives will be overwhelmed by the emotional connotations of the chance of a cure to their paralysis. In the face of this, how can they make a rational informed choice, even when presented with the risks and consequences. Especially when considering the fact that the risk is death. The volunteer had the chance of living out a life, albeit paralysed, instead by going through with the transplant could face the high likelyhood of death. If I were related to someone considering this procedure I’d definitely be against it, I’d rather have a living paralysed loved one than risk them on the tiny chance of a cure. Firstly, is it a brain (head) transplant or a whole body transplant? That is to say, is the head getting a new body or is the body getting a new brain? Secondly, what is the identity of the person? If person A’s head is attached to person B’s body, how do you identify the new person? By DNA and finger prints it would be person B. By thoughts, memory and retina it would be person A. Which family should stake claim on the new person? As mentioned in the article, would it not be prudent to give new lease of life to several patients than to give life to a person whose identity itself cannot be ascertained? If all above issues can be sorted out, question still remains if the procedure can be successful. The procedure involves joining of whole bundle of nerves and blood vessels. It may be noted that experiments were carried out on a monkey. The monkey survived for a week, but was paralysed neck down. The concept of transplanting a head seems rather absurd. With other transplants there is a chance of transplant rejection or complications that can lead to organ failure. Considering the fact that there is no solid evidence to suggest that the CNS can regenerate, then add on the chance of transplant rejection and organ failure or complications during the surgery, is there even a chance for survival? It seems to me that Canavero and Ren are just looking to chase fame rather than the pursuit of medical advancement. Maybe if more research is done to assure the public that the procedure has been put through trials, it could potentially be a medical and scientific break through. At this stage, it just looks like a man trying to play god. Although its an intriguing idea, the feasibility of the procedure seems quite far-fetched as not only would the solid organ be rejected but finding a donor to match all the requirement plus the bone marrow compatibility can be next to impossible as you would either have to radiate the entire body to match the immune cells in the head or vice versa, thus having two competing immune system causing the inevitable rejection. Furthermore, during the transplant the blood supply need to be maintained to the head as well as the body and event he slightest error in securing vessel, nerve connection can be quite fatal Thus the idea to create Frankenstein may be compelling and fun it should be remembered that some things might just not be possible. However, in the grant scheme innovations should never be stopped thus I believe the technology should be applied to helping spinal injury and nerve damage as who are we to choose who gets to live if we are trying to save the quadriplegic why not play God even further and help brain damage patients as well. Also looking into stem cell therapy may be more appropriate as it will cause these techniques to be quite redundant. Finally I say this surgeon is trying to gain fame through making something unethical and unfeasible sound interesting feeding into teenage driven media. I think the idea behind the surgery is good natured to an extent, as described in the argument. However, with medical developments you need to take precautions and they are tedious. The fact that Canavero is “dancing around the issues” speaks volumes as to the ethical danger of this procedure. I wholeheartedly agree with the decision against the procedure. Any other medical professional would approach the situation with more professionalism and care due to the sensitive nature of the subject. A truly interesting read and an innovative concept! It is hard to say if such a procedure is safe to undertake, and if the family/friends of the patient can withstand such a cure. Especially with the risk of death, perhaps a life of paralysis is better than chasing a slim chance of a normal life. Having said that, more research needs to be completed to form a well-versed opinion. Excellent start in any case! The contentious topic of the experimental surgical operation involving the grafting of one organism’s head onto the body of another is extremely difficult to tackle in the field of engineering, but you have done an extremely superlative job in this article. The moral dilemma of this scientific procedure is a compelling argument that outweighs the benefits. It is interesting to see the ethical debate of the head transplant procedure as proposed by Sergio Canavero. The idea of removing a patient’s head and attaching it to a decapitated human body is an extraordinary unethical procedure according to the medical community. In fact, medical experts and bioethicists have vociferously argued that the procedure is unethical and should not be performed. The article does well in touching upon a number of pros and cons relating to the issue, but as far as I’m concerned, this debate is only worth having once medical science and technology have advanced far enough that the practical side of things (i.e. the procedure itself) wouldn’t be a concern. The innovative idea of the head transplant is excellently written within this article. Although this could be a renowned breakthrough in the medical industry, the ethical consideration must be thoroughly examined due to the damaging effects it could cause to the rest of the body as it has been said that there could be a transplant rejection. The ‘one vs. many’ topic is an interesting read and shows a good viewpoint of how the process could disadvantage other UK patients. There could be more ethical dilemmas that could be explored such as the possible abuse of these transplants by the powerful and profiteers, the feelings of the organ donator’s family and the biological differences of the receiver and donor that could cause transplant rejection. Overall, however, this cogent debate is well-proposed. I particularly like the first point about how the first organ transplant was a great medical leap that caused a lot of controversy at the time. Ergo there could be great future utility which is at the moment unknown to us that could be garnered from this operation even if the transplant would not be often done in the future due to the utility argument brought up in the “one vs many” point and there are deontological concerns from the operation itself. Still not at all convinced by the feasibility of the operation itself though, the references contained in point have even furthered my doubt. The rats they’ve tried the procedure on lived only for a day and a half and the operation they tried was rather different (putting a rat head behind another one on one rat body)? And of course that humans don’t have regenerative central nervous systems. That seems like nowhere near the amount of evidence that such a complicated and ethically grey (at least) medical operation should have to justify its undertaking. Not sold as of yet. This is a brilliant example of the argument that “just because we can do it, doesn’t mean we should”. The repercussions of using this method of thinking could be catastrophic for both sides of the argument also. The concept of a head transplant may be revolutionary, and it may well transform the lives of many, but as the article mentions, there are a number of ethical considerations that must be made. This may be difficult depending on the conditions of those involved. There may also be ill-use of the lack of laws in certain countries to carry out the procedure. I think that due to the lack of evidence of the procedure being successful, in addition to the requirement of a full consent, which may be particularly difficult for a brain-dead patient, the procedure should not be performed.